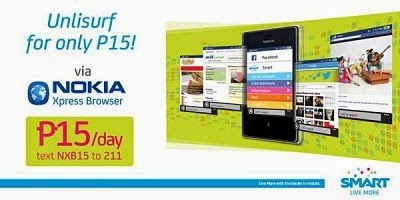 If you’re using Nokia Xpress browser on your Nokia phone then you’ll entitled to enjoy Smart latest promo UNLISURF 15. For only 15 pesos you can already surf and connect to the internet using the mention web browser valid for 1 day. The Nokia Xpress browser is preloaded or the default web browser for some S40 OS, Asha and Nokia X software platform. This browser does almost the same to Opera Mini, it saves and optimize web pages to render it smoothly on mobile devices. If you can recall, Smart also offer Unlisurf15 for Opera Mini browser from which this Nokia Xpress browser promo adapted. The difference when your register to this UNLISURF 15 is they have different promo code. For Nokia Xpress Browser users, please find details below on how to subscribe the promo. If you want to enrol on this promo, make sure you are using Nokia Xpress browser and don’t open links to points to other type of browser or app to avoid unwanted charges. Check if you are using the correct Smart GPRS and APN settings on your phone. Is this also available for Nokia Lumia 520 users with Nokia Xpress browser too? Does it work well? pwde mag re4gesred ang androids????? ?